The Cave Grave of King Arthur II. There are two detailed accounts of the burial of King Arthur II in a cave. One is in the Life of St Illtyd and the other is in the Marvels of Britain Section in the Nennius Histories written in AD 822 or earlier. As St Illtyd was a first cousin of King Arthur II the story of the burial is immediately interesting. King Tewdrig-Theoderic was the father of King Meurig-Maurice, and also the Princess Gweryla (aka Rhainguilda) who married a Prince named Bicanys of Brittany. St Illtyd was the son of Bicanys and Gweryla, and as King Arthur II was a son of King Meurig and Queen Onbrawst then Arthur II and Illtyd were first cousins, and very definitely contemporaries. Illtyd was a first a military commander and like many other Khumric generals and commanders he retired to become a Saint-Holy Man. There is a story of how St Gildas who as at Llancarfan Abbey in the Vale of Glamorgan made bells, and he made one for St David who had moved down to the Valley of Roses in South West Wales. Some monks who were taking the bell from Llancarfan Abbey to David were singing as they were going along the ancient road to the west, and as they passed by the Coed y Mwstyr woods St Illtyd -who was living in a cave there - heard them. Illtyd came to meet them and he admired the bell. When the monks told David, 120 miles away to the west, how Illtyd had admired the bell, David told them to take it back and give it to Illtyd. The point being that Illtyd was at the Coed y Mwstyr woods and Cave. In the Marvels of Britain and the Nennius Histories there is a story of a ship arriving at the mouth of the Ewenny River around two miles south of Illtyd's cave. The ship arrives at a place called Smooth Ridges and there is a large area of huge sand dunes on the west side of the Ewenny river estuary. The place of the general area is called Gwyr and today it is Ogwyr, and so there is very little, or no doubt at all, where this place is. A boat is sent up-river with a wrapped corpse and a stone and two important noblemen bring this body and stone to St Illtyd. 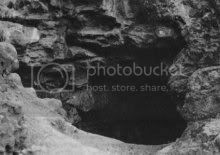 They enjoin Illtyd not to tell the name of the dead person to anyone, and Illtyd then takes the wrapped corpse into the Coed-y-Mwstyr cave and buries it inside the cave. In the Nennius version the tale is extended to tell of the corpse being later removed from the cave grave and taken to a church where it is reburied near the altar. One sub-king who was curious then went to the church and endeavoured to look under this altar and he was immediately struck blind. This was a salutary warning. As there is abundant evidence that King Arthur II was killed abroad outside of Britain, and that his corpse was wrapped in a sack made of three deerskins and placed in a ship for transportation back to Britain it is fairly obvious that this story refers to King Arthur being brought back and his body being handed over to his first cousin St Illtyd. When Colin Games and Blair Urquhart were filming inside the Coed-y-Mwstyr cave their camera accidentally panned across an area where there is an inscription in the ancient British Khumric Coelbren Alphabet that is covered by a film of stallacmite, and therefore it is ancient. This inscription states that the King lies buried here. Later the corpse was taken out of the cave for burial at a church and the obvious site is the First Century AD St Peter's church a few miles to the north of the cave. It was at this ruined site that Alan Wilson and Baram Blackett found the badly inscribed stone naming an Artorivs and a Mavricvs which would be Arthur (Arthmael) and his father Maurice-Meurig. As the grave of King Teithfallt is almost certainly at Llandyfodwg where there is an extraordinary grave stone, and as his son King Tewdrig is indisputably buried at Mathern, and his son King Meurig Uthyrpendragon is in the large grave mound inside the Giant Boat-Shaped "circle" at Caer Caradoc, then the royal corpse of Arthur II the son of Meurig is the person brought to St Illtyd at the Coed-y-Mwstyr cave. King Arthur's son King Morgan Mwynfawr is buried at the large grave mound named as Bedd (Grave of) Morgan Mwynfawr, and they only possible dead man in these Histories and Saints Lives in King Arthur II. Several ancient epic poems give details of Arthur's final burial, telling how all the 180 Mayors of Britain attended and how everyone was greatly reluctant to actually dig the grave, and so on. It is in fact the best and most detailed recorded funeral of the era that is misnamed as the Dark Ages. There were no Dark Ages in Britain before the London Establishment decided to obliterate all non-Anglo-Saxon History. Only an idiot would believe that Glastonbury founded in AD 941 has any relevance whatsoever. This idea of King Arthur II being buried at Glastonbury in Somerset is hilarious and totally ridiculous. It has to be one of Planet Earth's most monumental absurdities, and typical of what continues to flow out from Westminster and Whitehall in London. The wood is divided into three named sections. The Southern end is Coed Cad Einion for Wood of the Battle of Einion, where the Prince Owen, the son of King Howell Dda (the Good) sent his son Einion to attack the Glamorgan King in AD 948. Einion was killed and his army massacred. The central area is called Coed y Mwstyr or Wood of Mystery, and the Northern area is Coed y Pebyll for Wood of the Pavillion. This is the cave where arthur was initially buried not the cave that contains the Pavillion. in the Coed y Pebyll where the Pavillion is stored. The Pavillion is obvious to any Bible student. The English King Henry II and his cousin the Abbot Henry of Glastonbury came up with a pack of Political and Religious lies and fabrications, and all genuine British history and heritage has been distorted ever since. King Arthur II was a Khumric Welsh King and he lies buried in Glamorgan in South Wales. That is what the records and the evidence proves to be correct. If a 100 miles an hour storm followed by two 70 miles an hour storms had not struck the excavation site in 1990 then all of this would be over and 'done and dusted'. The London and Welsh politicians and the Churches are desperate to prevent any excavations re-commencing to actually retrieve the body of King Arthur II.